All Chatsworth homes currently listed for sale in Chatsworth as of 04/22/2019 are shown below. You can change the search criteria at any time by pressing the 'Change Search' button below. 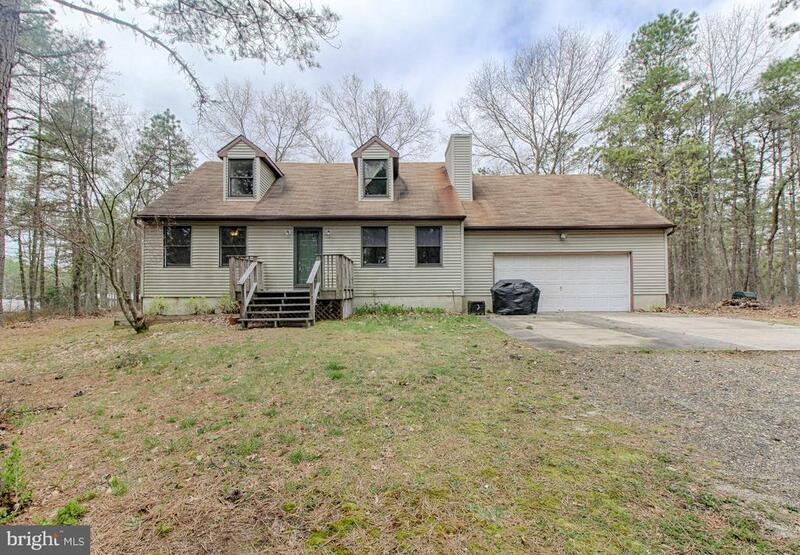 "MOTIVATED SELLER..SELLER SAYS OPEN TO OFFERS.....A true one of a kind Residence on 224 acres of farm land and secluded wooded grounds in Chatsworth. A long driveway leads you to an expansive property with a Custom Home surrounded by multiple areas distinctly separated for farming crops and raising livestock. Complete with an on-site 2 Story Barn, this parcel of land has been ideally laid out with all the potential to truly live off the land in the heart of the pines. Upon entry into the home, a three story Foyer is adorned with a textured wall papered accent wall along with a coat closet conveniently tucked under the staircase. The foyer leads to an open Dining Area with a wood burning stove as well as access to a covered porch. French Doors open to a separate room which could serves as a playroom or media room. Through the dining area is the open Gourmet Kitchen with custom cabinetry & shelving complimented by quartz counter-tops and stainless steel Bosch & Jenn-Air Appliances. Stylish hardware and Farm Style Sink complete the look. Pendant Lighting over the center island and dual Chandeliers illuminate the space and tie the rooms together. To the left of the foyer is a powder room and home office with wood mouldings & trim. There is a Sunken Living Room with solid hardwood flooring and a real wood fireplace with stone surround & wood mantle which serves as the focal point in this room. A set of sliders lead to another covered outdoor space. Towards the back section of the home is a customized Laundry Room, Utility Room, Mudroom and entry into the 2 Car Garage with Storage Space. On the 2nd level are 3 sizable Bedrooms and a Full Bathroom with granite counter-tops. Ample windows in each bedroom allow the natural light to enter the rooms. The Master Bedroom has Cathedral Ceilings and a Sun Deck. There are two Walk-In Closets and a gorgeous Carrara Marble Master Bathroom. The top level of the home is the ultimate space to entertain. There are 4 custom built-in Bunk B"
"Outdoor enthusiast, horse owner, nature lover look no further this is your HOME! Custom built log cabin sits on over 28 acres of land with several outbuildings. The main home offers 3 bedrooms and 3.5 bathrooms, updated kitchen, formal living room, great room and game room. The Kitchen has a generous size island, recycled glass countertops with beautiful backsplash and matching appliances. Kitchen is open to the dining room. The living room has natural light, wood burning fireplace and access to half bath and laundry/mud room. Enormous Great Room with high ceiling and exposed beams, french doors led to the side desk and from porch. Down stairs you will find a large game room with sliders to access fenced in yard, full bathroom, plenty of closets and storage room. You can access the 2 car garage from the basement. The 2 upstairs baths and half bath have been recently updated with ceramic tile floors and quartz countertops. There is an apartment above the detached garage that is great for extended family or rental income. There are barns with stalls, hay storage, tack room, pasture and riding ring, numerous trails through the 28 acres of land. This property is just amazing!" "Peace in the Pines awaits. Love space inside and out, then here it is. 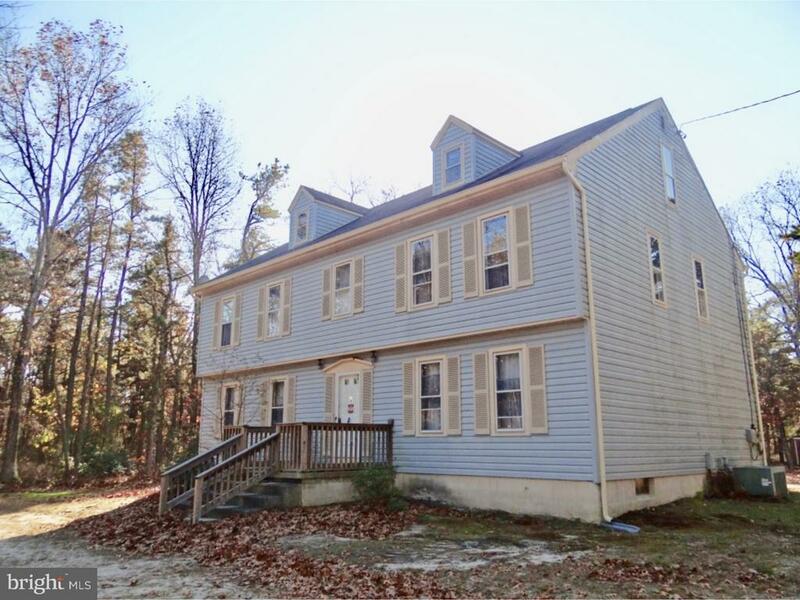 The long private drive leads to a large colonial sitting on 4.7 acres. The main home offers 4 generous bedrooms, a brand new master bath with walk in closet, formal living and dining area, family room with gas fireplace, office and large kitchen with island, hardwood floors and beautiful custom tile. The basement has four additional finished spaces currently being used as a laundry/sewing room, workout room, storage and workshop. Move outside to the oversized 2 car garage with an approved upstairs 2-3 bed with 1 bathroom apartment with stove, microwave, dishwasher, washer and dryer. Not done yet, there are 3 additional storage sheds and a large fenced in garden." "Welcome home to your own wooded oasis! 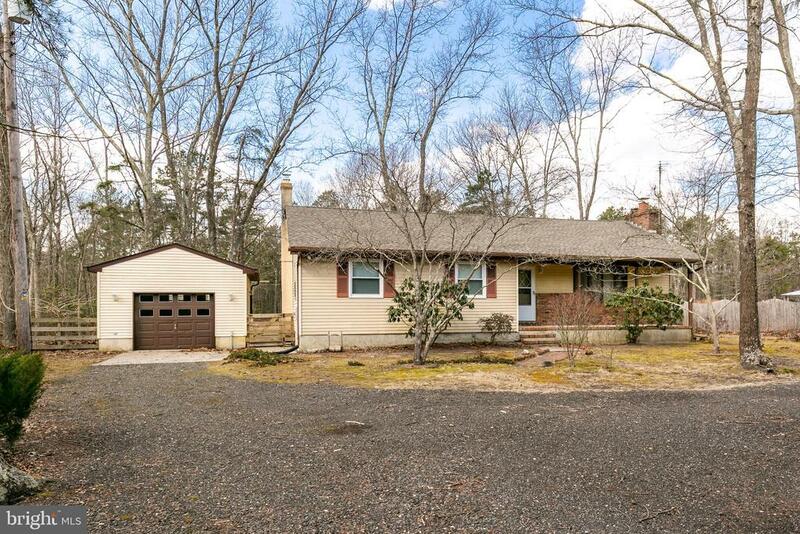 Set back from the road you'll find this charming 3 bedroom, 2.5 bath cape cod. This home offers a bright and open kitchen with adjoining dining room. The livingroom boasts a wood burning fireplace and plenty of natural light. Off the livingroom you'll find access to the unfinished basement as well as the first floor bedroom and bathroom. Upstairs you'll find two spacious bedrooms with ample closet space as well as another full bathroom. In addition to that this home offers a spacious laundry room with plenty of storage, a two car garage and is nestled on nearly 5 acres of land! Make this home your own private retreat today!" "Pristine pinelands protected location. Home backs up to legendary Batona Trail. Impeccably maintained 3 bedroom 2 full bath ranch. Large country eat in kitchen with solid wood cabinets and custom bar. Living room with brick fireplace and Bruce hardwood flooring. Spacious Master bedroom with newly remodeled en suite. 1400 sq ft basement with Original Pine Barron wood burning stove and blower, heats the whole home during those cold winter months. Fully insulated and dry walled 1 1/2 car detached garage, with electric, that leads to beautifully maintained backyard with large deck . 2 stall barn and fenced in paddock in as is condition. Completely new septic system installed October 2018. 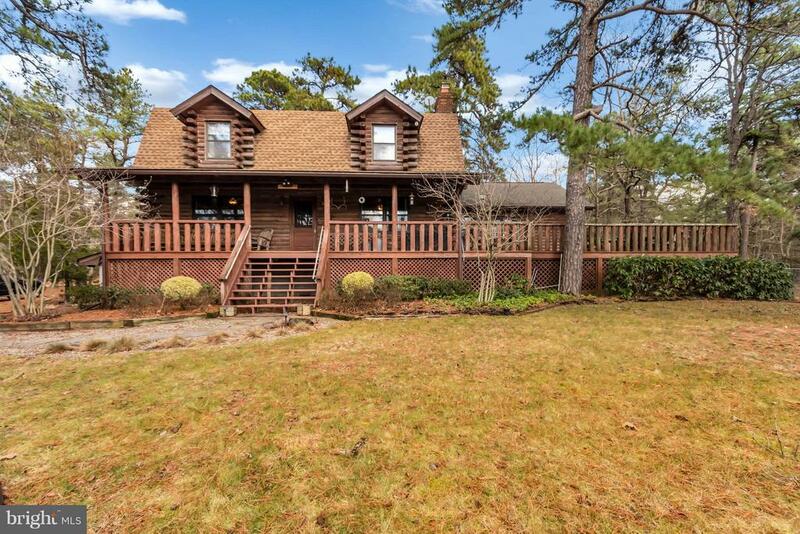 Peaceful and quiet area, only minutes from Long Beach Island and the Jersey Shore!!! Nice wooded lot with mostly mature oaks. Great deck and fenced in back yard, perfect for entertaining and pets. Functional home in a desirable neighborhood. Wont last long, make your appointment today. Bring us an offer!" 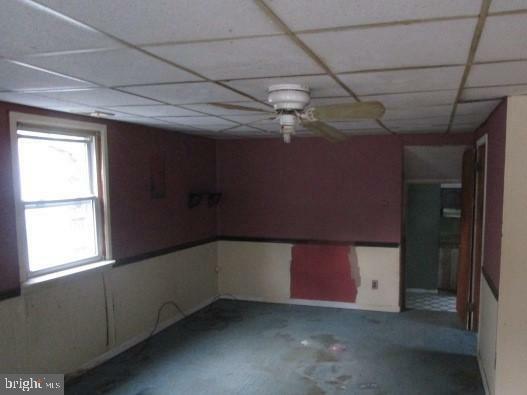 "4 bedroom 1 bath home in historic chatsworth on corner lot."